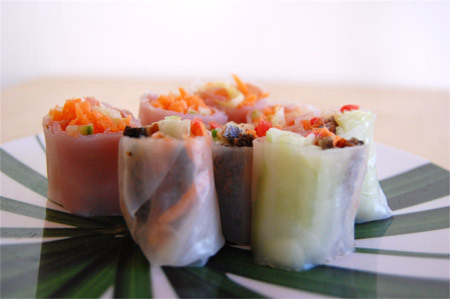 Fresh spring roll is one of my favorite food. Every time I go to Vietnamese restaurants, I order one plate. Few years ago in Japan we had a big “Asian food trend”, and many Asian restaurants (like Thai food, Indonesian food, Korean food, etc etc) opened everywhere. That time was the first time for me to eat fresh spring rolls. Fresh spring rolls in Japan might be little different from their original flavor, I think. I don’t remember there’s any herbs (coriander, mint) inside. I guess Japanese chefs changed the ingredients/recipe to match Japanese people’s taste. Now, spring rolls can be found anywhere in Japan too. When I go to Izakaya I always order fresh spring rolls. 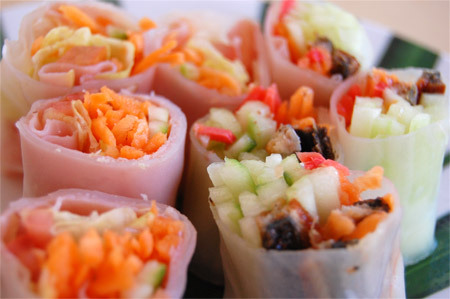 One of the reason I like spring rolls is that I can eat lots of fillings with thin skin. Sometimes I feel like some salad rolls, but bread sometimes really stuff me up. Then, I just use rice paper instead of bread. For Vietnamese people, those food I make might seem to be a really weird, I like it. Soak rice paper in water until it’s soft. Slice roasted unagi and cucumber. Roll up unagi, cucumber and ginger in softened rice paper. Personally I eat them without any sauces, but you can dip in any of your favorite sauce. Can these be made ahead of time for a bento? Ummm.. after a while the rice paper get dried, so it’s best to eat right after making.. 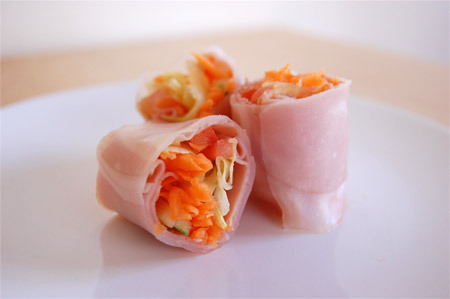 If you want to make them ahead and eat later, what you can do is wrap these spring rolls with dumped paper towel or something wet so that it keeps moist.